These Pumps are high head (upto 45 mts) with different capacities coupled to 2900 RPM motors. Excellent for scrubbing corrosive and aggressive gases like Cl2, Br2,12, SO2, CO3, etc. Used in transfer of chemical in batch process. Recommended for use against filter press in dyes and intermediate industries. All Models.- are available with PVDF impellers for high temp. upto 90oC. ALTRA-190 Model is high head (upto 50 mts) low capacity pump coupled to 2900 RPM motor. Excellent for vaccume ejectors. 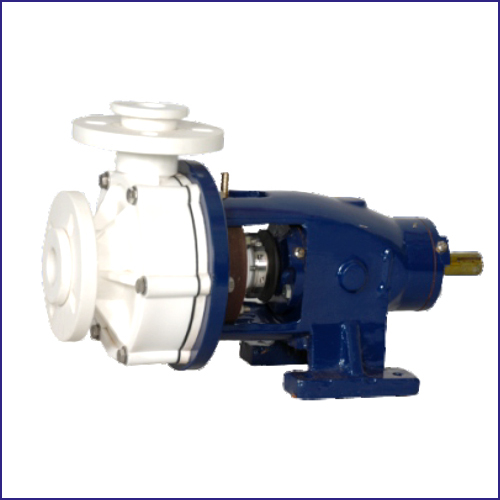 Pumps are available with Internal Mechanical Seals (IMS). Above pumps are also available in PTFE lined construction. Pumps are supplied with special Mech.Seals for applications like Slurries, thicker liquids, mixing fluids etc. Pumps are available in special material on request.